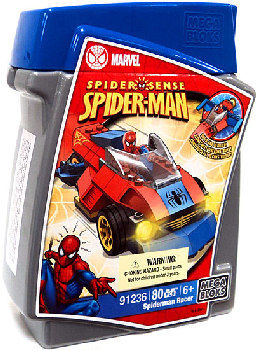 Description Of Item: With the Mega Bloks Marvel Build Vehicle - Spider-Man Racer 91236 you can build Spider-Man Speeder so he can cruise around town, searching for bad guys to put away! Slide Spider-Man into the driver seat and drive him around so he can thwart evil. Use the missile launcher to shoot at bad guys, or blast holes through buildings. With the vehicle, Spiderman can now bring back-up and weapons to the fight!